Actress Stephanie Beatriz of FOX's new sitcom "Brooklyn Nine-Nine" talks with Latin Times about playing detective Rosa Diaz, the show and her experience becoming an actress. Singer Francisca Valenzuela launches 60s inspired fashion line. 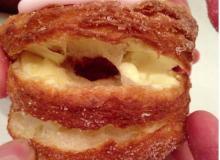 Meet New York's latest food craze: The Cronut.